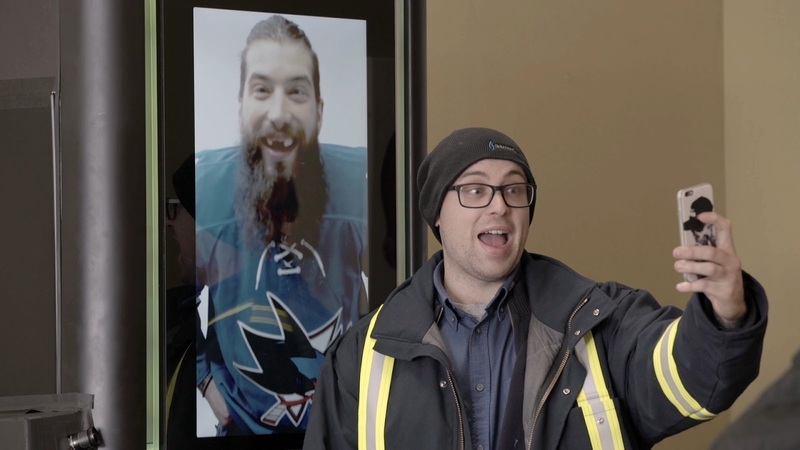 As hockey mania takes over Canada, Brent Burns (San Jose Sharks) one of the best defencemen in the NHL®, is teaming up with Pepsi Spire®, the innovative digital beverage fountain available only at SUBWAY® Restaurants in Canada, to inspire consumers to raise the flavour of their favorite Pepsi® beverages with totally customizable creations. To encourage consumers to raise the flavour of their favourite beverages, Burns "crashed" the Pepsi Spire®fountain at a SUBWAY® Restaurant in Quebec recently. Through virtual technology, Burns appeared on the machine's digital touchscreen to the delight (and sometimes surprise) of unassuming guests – he bounced off the boards, learned a little French, had some hilarious hockey talk, and ultimately helped fans create their very own Pepsi Spire concoctions. Canadian hockey fans who are enjoying the World Juniors and anticipating the 2017 Scotiabank NHL® Centennial Classic in Toronto on Jan. 1, 2017 will enjoy the timing of this entertaining video featuring one of Canada's most endearing hockey players. "I'm a huge fan of the Pepsi Spire® machine at SUBWAY® restaurants – I like to think of myself as a unique guy, and Spire® lets me add my own personal touch to my beverage," Burns said. "I also love the element of surprise, and got a big kick out of seeing how Canadians responded. It has been cool to interact with SUBWAY®guests via the Pepsi Spire® machine – I'm having a blast doing it, and the reactions were priceless." Pepsi Spire® is a sleek, innovative beverage fountain that puts hundreds of drink combinations at people's fingertips. Pepsi Spire® can pour up to three flavour shots simultaneously (lemon, vanilla, cherry), with fan-favorite beverages, like Mountain Dew™, Pepsi™ or Brisk™ Iced Tea and is found exclusively at SUBWAY®Restaurants in Canada. "At SUBWAY® we provide our guests with quality sandwiches and offerings prepared exactly the way they like it. By continuing to provide this level of customization through Pepsi Spire® we are able to further extend this personalized experience to our guests," Cristina Wells, Senior Director of National Marketing, SUBWAY®Restaurants Canada, said. "Brent's authentic style, love of the game and ability to mix things up made for a natural fit to connect and engage with our guests through Pepsi Spire®." For more information on Pepsi Spire®, visit pepsispire.com or subway.com; and follow @PepsiSpire on Twitter ; join SUBWAY® Canada's online community at facebook.com/SubwayCanada or follow @PepsiCanada, @SUBWAYCanada.